I was sitting on the living room couch talking with my husband and my 8 year old son was in the front yard. I saw flickers of an orange glow reflecting off of a box on the porch, through the living room window. I opened the door to see what it was when I saw my son standing past the end of the east side of the house, staring at the porch. I asked him what he was doing and what was going on. He walked quickly over to me and proceeded to tell me what he saw. He was crying and shaking and very scared. He said he saw a dark figure with really big, dark eyes, with an orange glow all around it. He said it looked like it was floating just a little off of the ground, came from behind my car and went next to the house and turned and looked at him. He said it then floated higher, and was about the height of the Christmas lights hanging on the porch. He said it looked at him. He slightly turned his head and closed his eyes briefly because he was scared. When he looked back it was gone. He said whatever he saw was about as tall as he is (about 4 feet). He said he couldn’t see its legs and its arms appeared to be straight down beside its body. He said its face was very dark and its eyes were really big and a slightly different color than the face. He said it glowed all around it. I estimate he was 40 to 50 feet from the entity, given where he was and where he said he saw it. I was during the daytime, at approximately 4:00 p.m. I saw the flickering orange glow for about 3 seconds and my son saw it for about 10 seconds. We live in a wooded area, have dogs in the back, and they did not bark at all. However, when I called my husband out to tell him what happened and to look for it, my small house dog came out and immediately started smelling the ground where my son said the entity had been floating. I am of sound mind, I have never seen or heard of anything like this before, and I am very curious and somewhat confused about what happened. Mr. Davenport, I am requesting that my submission on (12/6/09) regarding my son's observation of an orange, glowing, dark figure (on 12/5/09) be removed, or not be posted. I have reason to believe that his apparent experience may not be accurate. Again, please do not post the report that was made regarding his "experience." After questioning him further, it may have simply been the sun shining in his eyes or something. Thank you. 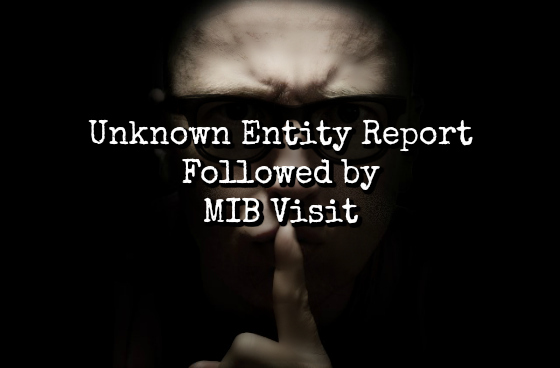 Now...this relative of the woman who filed the report (who I believe was a brother) told me that a few days after the report was filed, 2 men dressed in black suits arrived at the woman's residence driving a black full size car (he believes it was a 2000 Ford Crown Victoria). This relative happened to be at the woman's residence when then men arrived. It was approximately 2:00 pm local time and they knocked on the back door. The woman answered the door and they introduced themselves as investigators for the state of Oklahoma. They quickly flashed identification and asked to speak with the woman who made the report. The relative was sitting at the kitchen table and heard the conversation. The 2 men refused to come inside and wanted the woman to come out onto the porch. The relative looked out the side window and noticed the vehicle. After 5 minutes or so, the woman came back into the house and was visibly upset. Without saying a word, she immediately went online on the family computer. The relative asked her several times what had occurred, but she refused to talk by simply saying 'wait.' The relative sat in the living room watching the woman on the computer. A while later, she shut down the computer and sat next to the relative. She explained that the 2 men asked her what her son had seen. After telling them about the encounter, they 'requested' that she 'withdrawal the report ASAP' and to 'forget the incident.' She was still very shaken and explained that the men just acted 'weird.' The man who talked sounded like he was reading from a script. She asked the relative to go to her son's school and pick him up instead of letting him take the bus home. When the relative and her son got home, the woman was sitting at the kitchen table reading the Bible. She told the boy not to ever talk about what had happened. As far as the relative knows, there was no further contact by anyone else. There had been several strange incidents at the residence over the years, including a UFO that hovered over the house and was witnessed by the entire household. It was never reported. The family moved to another state in 2014. There was one more aspect to this account that was interesting, but I'm not sure if it applies. The boy who witnessed the 'entity' has had severe mental issues since the encounter; but the relative refused to go into detail. He only mentioned it because the boy's mother believes that the incident was to blamed for the boy's problems.